An artist's concept of Kepler-16b, the first planet known to orbit two stars. Planets around binary stars may be as common as those around single suns. 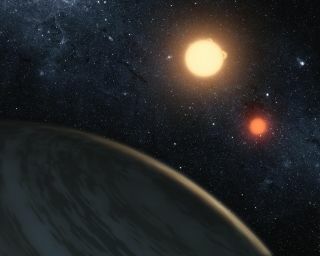 Worlds with two close suns, like the fictional planet Tatooine in "Star Wars," may be just as common as their single-star cousins — and sometimes, like a mythological phoenix, such planets might be born from the ashes of one star's death. A new study reveals that the most massive worlds occur nearly as often around tight pairs of stars as they do around singles. While most planets that orbit one star came into being along with their sun, some of the worlds orbiting two tightly paired objects may have come from one of the stars' debris. "That's changing now, thanks to direct imaging, and also thanks to [NASA's] Kepler spacecraft," she said. Binary star systems, which contain two suns rather than a single star, are abundant throughout the galaxy. According to Bonavita, more than half of the stars in our sun's neighborhood have at least one companion. When the two stars are far apart, a planet's path travels around only one of the stars. But if the stars are close enough to each other, worlds can travel around both stars in circumbinary orbits. In all but the most tightly packed systems, however, finding planets around the pair can be a challenge. That's because most detections are made indirectly, through either the radial velocity method, which tracks the gravitational wobble a planet causes in its star, or the transit method, where light from the star dips in brightness as a planet eclipses its sun. Most radial-velocity planetary surveys omit known binary stars completely, while the need for longer observations makes identifying binary-orbiting planets a challenge in transit surveys. That doesn't mean that they can't be spotted, however — Kepler's long observations helped researchers identify more than a half-dozen circumbinary stars. Planets with multiple suns can only exist in a handful of stable orbits that can endure through the life of the stars. If their stars are too far apart, the planets are more likely to orbit just one of them, or risk being ejected completely from the system. However, as long as the suns are within 92 billion miles (150 billion kilometers), or about 1,000 times the Earth-sun distance, planets can safely dance around both in what Bonavita calls "moderately wide orbits." Those wider orbits can be captured by a third method of planetary detection known as direct imaging. Unlike transit and radial-velocity methods, in the direct-imaging approach, a photograph is taken of a planet that is orbiting its sun (or suns). Since this method relies on a coronagraph to block the starlight, the direct-imaging method favors planets that are in wider orbits that won't be covered up. "Imaging searches are more sensitive to planets in the outer regions, and very tight binaries can be treated as singles when it comes to coronagraphic observations," Bonavita said. "Therefore, circumbinary planets are indeed ideal targets for those surveys." When direct imaging is used, larger planets are easier to spot than their smaller cousins. Calculating their mass precisely can be a bit more challenging, however. Many of the objects that are seen with this method fall between the realm of massive planets and brown dwarfs, which are even larger. Because the extremely massive brown dwarfs are too small to kick-start hydrogen fusion in their cores like their stellar cousins, they are often called "failed stars." Bonavita examined the number of substellar companions — the collection of objects that could be either brown dwarfs or giant planets — that were found in multistar orbits in 23 existing surveys, including SPOTS. She found that they occurred nearly as often around two stars as they did around one. "There is no strong difference, in terms of frequency of substellar companions in wide orbits, between close binaries and single stars," Bonavita said. While most direct-imaging surveys focus on single stars, SPOTS deliberately searches for potential pairs that could host planets. The survey is halfway through observing 67 pairs over a span of four to five years. The research was recently published in the journal Astronomy & Astrophysics. Most planets form from the disk of dust and gas left behind after the birth of their star or stars. After jostling one another for the most stable orbit, these first-generation planets can potentially survive until the end of the lifetime of one of their suns. One example is Kepler-16b, the first confirmed circumbinary world. But when one sun dies, the system changes drastically. The dying star can either explode in a supernova or shed its exterior material, occasionally leaving behind a small dim core known as a white dwarf, a city-sized object more massive than the sun. The dense companion can pull material from the other star in the pair. Most planets aren't expected to survive the violent end of their stars' evolution. But there have been reports of several planets orbiting double stars where the white dwarf is sucking material from its companion. "Such planets, if real, are either the remnants of the original planetary system that survived the violent evolution of the stars or [bodies that] formed after the interaction," Bonavita said, cautioning that the reported worlds remained unconfirmed. Like the mythological phoenixes, secondary worlds would rise from the ashes — in this case, the dust and gas — left behind by the death of the star. According to past studies, if binary planets commonly survived the death of one parent star, they would be plentiful around debris-sharing stars, Bonavita said. Since such planets aren't frequently observed, that suggests that it is more likely for them to have formed from the ashes after one of the stars blew out to form a white dwarf. Unfortunately, that doesn't mean that terrestrial worlds like the fictional Tatooine may be common. Like the phoenix of old, it would be rare for habitable worlds to emerge around these stars. "A second-generation, Earth-sized planet would be harder to form, because of the lack of heavy elements," Bonavita said, referring to worlds created after one of their stars had died. If a rocky "phoenix" world did manage to form from the ashes of a star, it would experience extreme radiation from the bodies it orbited, making habitability tricky. "It would definitely be harder for a second generation planet to be habitable, because any atmosphere would be stripped away during the common envelope phase," she said.